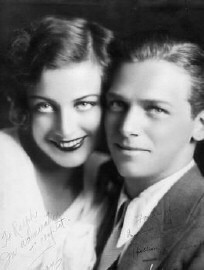 Joan's professional ascension coincided with a personal one: Her new romance with a very eligible Hollywood bachelor--Douglas Fairbanks, Jr., the son of silent-screen star Douglas Fairbanks. Fairbanks Sr. and second wife Mary Pickford were Hollywood royalty and an invitation to their home, Pickfair, was a guarantee that one had "arrived" socially in town. The couple were cool to Joan at first, but months after Joan and Doug Jr.'s marriage in June 1929, an invitation to Pickfair was finally forthcoming (after Britain's Lord Mountbatten specifically requested a meeting with Joan). While 1929 saw Joan busy trying on her more serious and subdued personality (less gum-chewing, fewer bows on her shoes and clothes, more reading of the books Doug recommended), there was also a seismic change afoot in the film industry: the advent of talking pictures. While the Talkies proved problematic for some non-English-speaking stars and those (such as Clara Bow and John Gilbert) whose voices didn't match their screen personas, Joan's sultry voice and looks were a perfect fit; she made the transition to sound easily and remained a fan favorite. 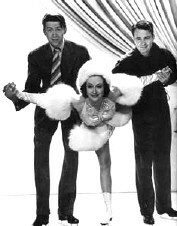 MGM featured her in a song-and-dance number in their star-studded sound showcase Hollywood Revue of 1929 and, after one more Silent (a successful Daughters sequel-of-sorts, Our Modern Maidens, with husband Fairbanks in their only appearance together), Joan made her Talkie debut in Untamed with newcomer Robert Montgomery. Joan's wild flapper days were over, and in the early 1930s she began to seek, and to be offered, film roles that would showcase her abilities as a "serious" actress. 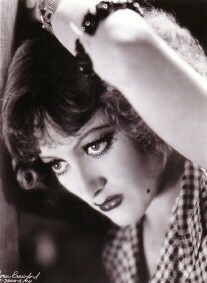 While some of the plum and bigger-budget roles went to MGM production chief Irving Thalberg's wife Norma Shearer and Greta Garbo, Joan remained one of the studio's priorities (not surprisingly, since Joan's money-making pictures were what paid for the expensive, but less commercially successful, Shearer and Garbo vehicles). From 1930 to 1933 MGM featured Joan in a string of dramatic films---Paid, Dance Fools Dance, Laughing Sinners, This Modern Age, Possessed, Grand Hotel, Letty Lynton, Rain, and Today We Live. Paid was Joan's first "prestige" drama, and her intense performance as a wrongfully-accused inmate seeking revenge garnered good reviews. The all-star vehicle Grand Hotel (Joan plus Garbo and the Barrymore brothers, which proved that the radiant, fresh Joan could hold her own among, if not surpass, both the "biggies" and the rather stagnant picture itself) and Letty Lynton were wildly successful (the latter creating a fashion craze with the Adrian-designed Letty dress), as to a lesser extent were Joan's three films (Fools, Sinners, Possessed) with rising star Clark Gable, thanks largely to the pair's onscreen chemistry. On the flip-side, however, the sluggish This Modern Age (co-starring acclaimed stage actress Pauline Frederick) and Today We Live (with Howard Hawks directing and Gary Cooper and future Joan-husband Franchot Tone co-starring) turned out to be duds both critically and commercially. Another flop was 1932's Rain, by far Joan's most personally ambitious project to date: At her request, she was loaned out from MGM to United Artists to reprise the role of prostitute "Sadie Thompson," which had initially been played on the stage by Jeanne Eagels. Despite a riveting and realistic performance that garners acclaim from many critics today, contemporary reviews for Rain were lukewarm or downright dismissive and box office was poor. After the failure of the grittier Joan persona in Rain, MGM decided on a new tack for Joan's career and from 1933 through 1936 featured her in a series of glossy formula pictures that required little more of her than that she project her natural charisma onscreen while looking sleek in Adrian-designed gowns. She appeared four times during this period with Clark Gable (her most-frequent leading man); of these films, their most entertaining and successful was '33's Dancing Lady, which MGM later called a bellwether of commercial movie-making for the company. Frothy onscreen love triangles, or even quadrangles, were the order of the day: Aside from Dancing Lady with Joan/Gable/Tone, films such as '34's Sadie McKee (Joan/Tone/Gene Raymond/Edward Arnold), '34's Chained (Joan/Gable/Otto Kruger), '34's Forsaking All Others (Joan/Gable/Montgomery), '35's No More Ladies (Joan/Tone/Montgomery), and '36's Love on the Run (Joan/Gable/Tone) all showcased Joan as a charming Adrian-bedecked clotheshorse and consequently brought in big box-office. Joan's top Hollywood status was officially cemented by the media at this period in her career: The Motion Picture Herald had instituted their "Top Ten Box Office" list in 1932; Joan appeared regularly from '32 through '36 (fellow early-MGM queens Garbo and Shearer permanently fell off the list after '32 and '34, respectively). And in early 1937, Joan was named "Queen of the Movies" by Life magazine. Despite the newly-bestowed "Queen" title, 1937 and 1938 (and early '39) proved to be less than successful professionally for Joan. (Her descent out of public favor had probably already begun, though, with 1936's The Gorgeous Hussy, a period picture about the Andrew Jackson administration that most involved later agreed was ill-conceived as a whole. While conventional wisdom says that Joan was simply too "modern" to play 1800s, the film's weak writing and plot were probably more to blame for the lack of success than Joan's sausage-curls.) In 1937, Joan appeared with William Powell in the underrated (and underperforming) The Last of Mrs. Cheyney, about a pair of charming high-society jewel thieves, followed by the equally unsuccessful The Bride Wore Red, a rather fruity Alpine romp with Robert Young and Franchot Tone supplying the usual love triangle and Joan supplying the by-now usual "girl from the wrong side of the tracks" angle. The formulas, and the film pairings, seemed to be wearing thin with both the public and press. In early 1938, a movie trade paper listed Joan, along with other luminaries such as Katharine Hepburn and Fred Astaire and Marlene Dietrich, as "Box Office Poison." The article itself complained more about the old-fashioned style and plots of current movies than about the actual stars, but the label stuck to the individual stars nonetheless and caused a great deal of consternation in the industry. In 1938, MGM co-starred Joan with some fresh blood--Spencer Tracy. The two created some sparks both on- and offscreen, but the worn love-triangle plot-line of Mannequin remained similar to previous Crawford fare. In the meantime, Joan had personally scouted out the Broadway show The Shining Hour as the next film vehicle for herself in 1938. The acting of Joan and co-stars Margaret Sullavan, Melvyn Douglas, and Fay Bainter was strong, but again the plot-line of a nightclub gal trying to win over the family of her wealthy lover was old-hat and the film did little commercially. Joan's first film of 1939 continued the string of less-than-successful efforts: She and James Stewart starred as struggling skaters in The Ice Follies of 1939, cheesily designed primarily to showcase the Ice Follies revue, which had recently signed with MGM. Prematurely menopausal as she may have felt, Joan wasn't quite ready to go down without a fight. Just now MGM was gearing up for an all-star film version of a major Broadway play, The Women, and Joan begged MGM-head Louis B. Mayer and acclaimed director George Cukor for the role of the hard-edged, man-stealing shopgirl Crystal Allen, a character that was a decided departure from her usual "good egg" onscreen persona (as well as a departure from her usual top billing). She got the part and was pitted against the saccharine charms of top-billed Norma Shearer as well as the combined talents of a strong all-female cast that included Rosalind Russell. Joan's newfound onscreen edginess and the film were hits, both critically and commercially. 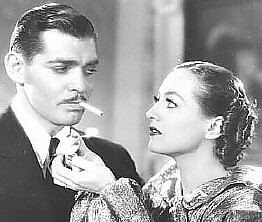 The Women's follow-up, 1940's Strange Cargo, featured Joan as the hard-bitten Julie, a cabaret singer who struggles to escape a penal-colony island with convict Clark Gable. (This was the final screen pairing for Joan and Gable, then fresh from his triumph in Gone With the Wind.) 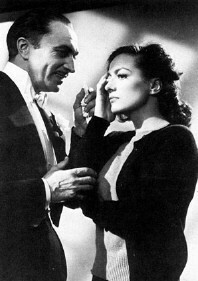 Joan's character was tough, sensitive, and decidedly non-glitzy--she appears throughout most of the film in an increasingly tattered dress, wearing little or no makeup while she bites, kicks, and snarls her way through the jungle, more than holding her own against a boat-load of desperate men and a gentle Christlike figure who can't quite get her to come over to his way of thinking. 1940's Susan and God reunited Joan with Cukor (who she later said was one of the directors who influenced her most). 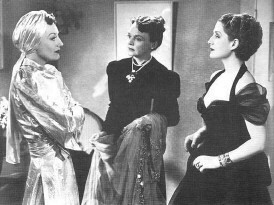 In another character departure, Joan plays a giddily high-strung socialite who tries to infuse her rich friends with her newfound religious enthusiasm, while ignoring her long-suffering husband (Frederic March) and daughter. Her next film, her last collaboration with Cukor, was the intense and sensitively acted A Woman's Face, a remake of a Swedish film starring Ingrid Bergman. Joan's "Anna Holm" is a facially marred woman led by bitterness at her social ostracism to a life of crime and sadistic control by the wicked Conrad Veidt until a kindly doctor (Melvyn Douglas) offers experimental surgery to correct her disfigurement. There were top executives who thought me all washed up. They still regarded me as Letty Lynton. They actually laughed when I wanted to do pictures like Random Harvest and Marie Curie. If you think I made poor films at MGM after A Woman's Face, you should have seen the ones I went on suspension not to make! In June of 1943, after 18 years of collaboration, Joan and MGM mutually parted ways. Two days later, Joan signed with Warner Brothers for approximately one third of her former salary.